Native Instruments has released its new entry-level DJ controller, the Traktor Kontrol S2 MK3. The S2 MK3 is a smaller version of the equally new Traktor Kontrol S4 MK3, and a new version of Traktor Pro, Traktor Pro 3. 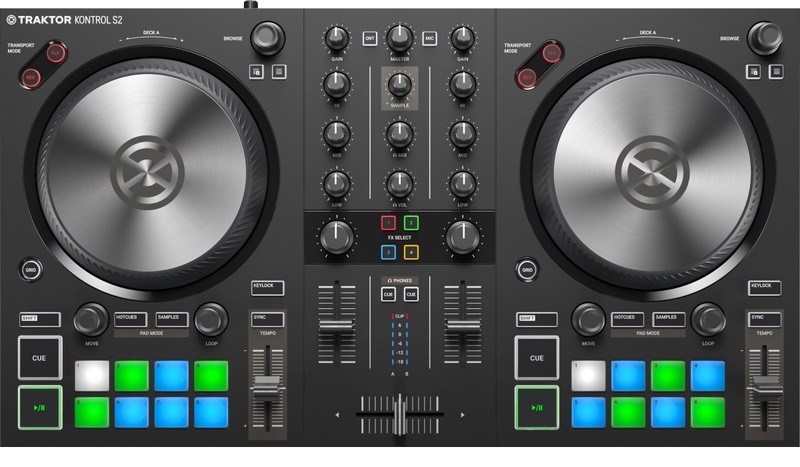 The decks on the S2 MK3 are no longer mirrored, so now the two decks are identical, with the CUE and PLAY/PAUSE buttons on the left and the pitch fader on the right. The jog wheels take quite a bit of space, as they are larger than the ones on the Traktor Kontrol S2. MK2. Again, no motorized jogs or haptic feedback as on the S4 MK3, but that is totally understandable considering the price. The S2 MK3 has no effect modules per deck, but there is the mixer FX section that allows engaging 4 effects with individual knobs per channel. This is a simple solution and fits the target audience. Finally, the S3 MK2 has a USB output on the back marked “IOS”, and that is a clear indicator that this controller is compatible with Traktor DJ. Expect a new version of Traktor DJ to be launched together or closely after the launch of the S2 MK3.